​We help our clients get organized at home, the office and during a move. 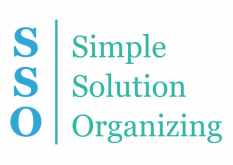 Simple Solution Organizing, LLC: Adele Gross is a member of NAPO and NAPO GA, National Association of Professional Organizers, Georgia. Adele Tusson-Gross, Founder of Simple Solution Organizing, believes that education and continual education is very important. She is a member of NAPO GA and has attended 6 NAPO Organizing Conferences and will attend her 7th in April 2019 in FT. Worth, Texas. What makes a Professional Organizer professional? Education, confidentiality practices, ethics, integrity, objectivity, and competence. These principles are an integral part of how we conduct business. Home Organizing: Your home is your sanctuary. We specialize in home offices organizing paper and digital clutter. We organize kitchens, closets, bathrooms and other rooms. Visit our Residential page for more details. Office Organizing for Businesses: We offer seminars, lunch n' learn presentations, and one-on-one consulting to motivate you and your employees to improve efficiency. Financial and Life Organizing: This service helps seniors who want or need extra assistance managing their personal and financial affairs. We also provide this service to busy professionals. We are licensed, insured, and will provide personal references. Life Organizing page. Senior Downsizing, Moving, and Relocating: Moving is one of the most stressful life events. Let us help with the details. Visit our Downsizing page. To learn more about Adele visit our About Page. Do you want to see before and after photos? Visit our Photo Gallery. Email: Please click the Contact Button above to send us an email. We are based out of Watkinsville, Georgia. However, we service clients in Athens, Bogart, Jefferson, Gainesville, Monroe, Winder and surrounding cities, Call us today at 706-714-1314.